Well, now they’ve done it. They’ve pierced the veil between the living and the dead; they’ve tampered in God’s domain; they’ve invented a whole new kind of monster, and they don’t even have a name for it yet. Folks, this is Jeremiah Collins. He was shot in the face two weeks ago, and he died on Friday. But yesterday, Angelique decided that Barnabas and Josette were getting too cozy, so she’s brought Jeremiah back for an encore. Wave hello to the folks, Jeremiah. That’s a good boy. Josette and Naomi are horrified when they visit Jeremiah’s grave, and they see his dead hand break through the soil. They scream, and they flee, and he busts his way out of the ground and comes after them. Josette and Naomi may not know what’s going on, but we do. We’ve seen it a million times. Jeremiah’s a zombie. It’s time to board up the windows and aim for the head, or he’ll bust in and start eating brains. Check the lawn; maybe we’ve got a couple Pea Shooters or a Cabbage-pult lying around. You never know when a Cabbage-pult is going to come in handy. Oh, except for one thing — zombies don’t exist yet, at least not like that. The first zombie movie — the one that establishes all the rules of zombies as we know them — was Night of the Living Dead, which was released in October 1968. That’s still ten months away. So what the hell is this guy? Josette and Naomi run back to the house, and obviously Andre and Joshua find it hard to believe their crazy story. Dead people don’t just get up out of their graves and walk around, at least not until next October. Originally, the word “zombie” comes from Haitian folklore, but the Haitian zombies aren’t murderous brain-eaters. They’re raised from the dead and enslaved by bokors, sorcerors who practice both light and dark magic. One version of the Haitian zombie story is that it’s a trick, and zombies aren’t really dead at all. The bokor actually doses a victim with poison extracted from a puffer fish, which slows the victim’s vital signs and makes him appear dead. The victim is buried, and then the bokor returns to dig up the “corpse” and revive him. The bokor keeps the “undead” victim drugged, so that he’ll work for the bokor as a mindless, shuffling slave. In the other version of the story, the bokor really does have magic powers, and the zombie is actually a reanimated dead person. But either way, the zombie’s just a servant of the sorceror. The Haitian zombie story shuffled its way over to America during the US occupation of Haiti, which lasted from 1915 to 1934. The Americans heard stories of “zombies” raised from the dead, and obviously you can’t keep that kind of thing to yourself. The first popular book about zombies was The Magic Island, a 1929 report by journalist, occultist and all-around freakshow William Seabrook. Seabrook spent an unfortunate amount of time trying to find out what human meat tasted like, and actually got someone at a hospital to give him a chunk of dead human to try out, so obviously he’s a hugely reliable source. In 1932, Bela Lugosi starred in the first zombie movie, White Zombie, based on Seabrook’s book. Lugosi plays a Haitian voodoo master named Murder Legendre, who helps a man drug and enslave a young woman during her wedding ceremony. 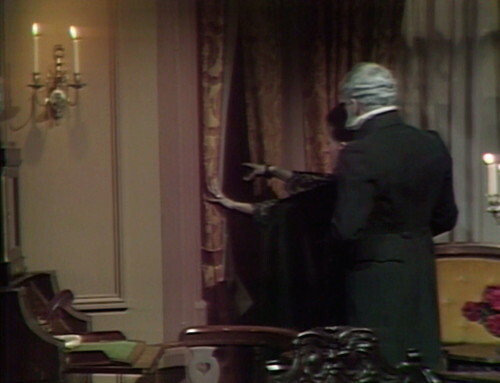 This just goes to show that you can’t get very far in Dark Shadows without running into Lugosi one way or another. But that’s not quite what’s going on here. Yes, Angelique and the du Prés family come from a Caribbean island, and Angelique uses voodoo totems to cast her evil spells, but she didn’t drug Jeremiah to bring him back as a mindless slave. Yesterday, she raised the dead with a ritual, using a clay figure in a little coffin. Then she had to lure Josette to Jeremiah’s grave, to call his name and summon him back to our world. But now that he’s up and about, Angelique doesn’t seem to be controlling him directly, and he isn’t just haunting Josette. Even after a shaken Josette goes upstairs, Naomi looks out of the drawing room window, and sees this mangled mess of a man looking in at her. This boy is tore up from the floor up. Of course, when she tries to show Joshua, the creature has disappeared, and Joshua doesn’t see him. That’s not really the zombie M.O., either for the Haitian kind or for the modern brain-eating kind. Appearing and disappearing is a ghost haunting trick, a metaphor for guilt, as seen in The Telltale Heart, The Turn of the Screw and Scooby-Doo, which doesn’t exist yet either. Modern zombies aren’t a metaphor for guilt; they’re a metaphor for infection and treachery. Zombies lunge at their victims and bite them, killing them and infecting them with zombie germs. It’s actually kind of sweet, if you look at it in the right way. His love for her is so strong that he digs his way out of the cemetery to tell her about it. 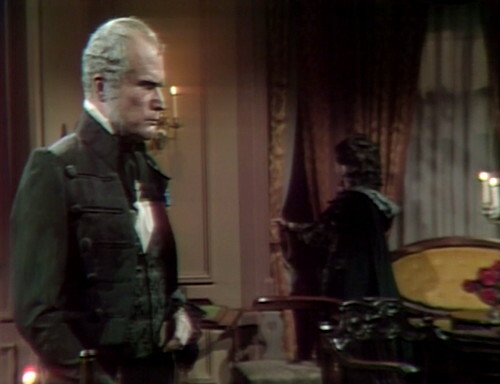 That’s because Jeremiah is now a member of Dark Shadows’ most important monster class: “the dead”. 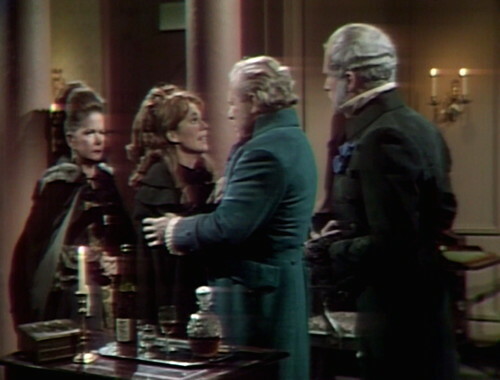 There are four basic monster categories on Dark Shadows — the dead, magicians, transformations and miscellaneous. The key member of the magicians class, obviously, is Angelique, and later on in the series we’ll see Bathia Mapes, Nicholas Blair, Magda, Julianka, Count Petofi and the Parallel Time Timothy Stokes. You can also make a case that Julia and Dr. Lang are alchemists, which is basically the same thing as a magician, but using science-y talk. The transformations category is mostly werewolves, but we’ve also got Cyrus Longworth in 1970, and Joshua turning into a cat. And then miscellaneous is for the vague, shadowy figures like Diabolos and the Leviathans. But the core monster type is “the dead”, and we see lots of variations over the course of the series. This includes ghosts, vampires, specters, zombies, Frankensteins, succubi and whatever the plural of “phoenix” is. This monster type is so scary that they don’t really have to do anything except show up, as Jeremiah is doing here. He’s not attacking Josette, or sucking out her life force; he’s basically just shown up to have a little chat about how much he loves her. But the very existence of “the dead” is an inherently destabilizing force, because it means that you can’t ever leave the past behind. Yesterday, standing at Jeremiah’s grave, Josette and Barnabas had an emotionally healthy conversation for pretty much the first time ever. They both expressed remorse for killing Jeremiah, and they apologized to each other. It’s clearly too soon for them to find their way back to each other, but it was a step in that direction, and Angelique can see it coming. Without a strong boundary line between the living and the dead, you can never have closure, or peace. You can’t grieve, and you can’t move on, which is exactly what Angelique wants here. A dead friend will always need you; a dead enemy will come back to get you. There’s no escape, no way to grow. You can’t get to higher ground, as Josette and Barnabas are struggling to do, and reflect on what you’ve done. Halfway through the episode, the family decides that they’re sick and tired of being haunted all the time, so they move into the new house, Collinwood. But as they’re getting settled, Natalie and Naomi hear someone banging around in the suite that was supposed to be Jeremiah’s room. At first, they think this is where Vicki is hiding — but then they hear zombie Jeremiah’s ghoulish laugh, and they run away again. So this version of “the dead” isn’t just haunting Josette and Barnabas. It’s affecting the whole family, dragging them all down into the grave. Barnabas’ original sin taints the Collins family for centuries; it won’t lie down and die. So this is an amazing example of how confident they’ve become, since embarking on this crazy 1795 storyline. 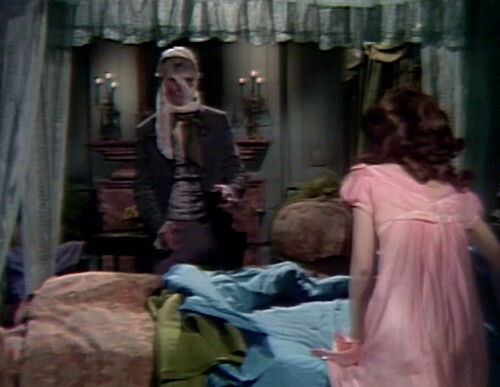 It wasn’t that long ago that they were being coy about whether Barnabas was a vampire or not; they’ve still never used the word “vampire” on the show yet. But now they’re making up their own mash-up monsters, pulling elements from voodoo films, Edgar Allen Poe stories and EC horror comics to create something unpredictable and new. They’re not tiptoeing around it anymore. Welcome to the spook show. When Andre and Natalie are at the door of Josette’s room, about to exit, you can see the shadow of Jeremiah’s ghost running across the set to get into position. In the Collinwood foyer, when Joshua asks Natalie, “Is something wrong, madam?” a stagehand is seen moving across the bottom of the screen. Timothy Gordon is still playing Jeremiah’s beat-up corpse, but the monster’s voice is performed by Addison Powell. Powell will appear onscreen as a judge in some later 1795 episodes, and then as Dr. Eric Lang once we return to 1968. On the day that this episode aired — December 27, 1967 — The Wall Street Journal published an article about Dark Shadows, with the delightful title “Daytime Horror Show Lures the Housewives From Their Ironing.” I haven’t tracked this article down yet, but I’ll find it someday. The zombies working in the Haiti sugar plantation in ‘White Zombie’ gave me nightmares when I first saw it. Angelique’s ritual of using the clay doll to reanimate Jeremiah’s corpse vaguely reminded me of an X-File involving a ‘golem’ – an artificial creature created by magic, often to serve it’s creator. 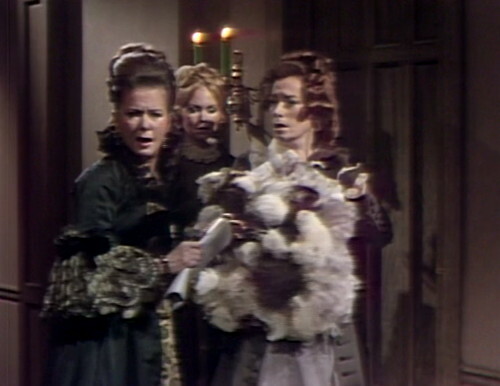 Also Naomi and Josette saw Josette’s deceased husband clawing his way out of the ground – this would seem to me a situation requiring more hysteria on their part (as well as the need for some smelling salts or brandy). Also how did ‘Jeremiah’ get out of his coffin? That’s a good question about the coffin; that’s something I’ve never understood about modern zombies. In the Haitian version, the bokor digs up the coffin and opens it before reviving the zombie. But modern zombies seem to just sprout up, magically released. Even if you say “he scratched his way through the wood”, it wouldn’t work. People are buried with their hands folded or at their sides, and there’s not enough space inside to reach up and start scratching. The hands are pointed in exactly the wrong direction. They’re corporeal ghosts who come back to terrorize the living. The most famous pop cultural example is THE CROW. Oh, thank you for pointing that out! I’ve heard the word revenant before, but I was so busy with zombies that I didn’t think about other influences. You’re absolutely right. Smelling salts or Brandy for Josette and Cherrie for Naomi. If Jeremiah can materialize and dematerialize through walls, he can also get out of his coffin. 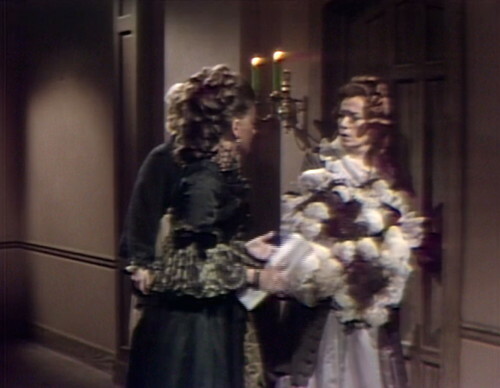 I think “White Zombie” might have influenced Dark Shadows earlier than this episode–the scenes with Madge Bellamy wandering mindlessly around Legendre’s gothic castle (in Haiti??) are eerily like the scenes of Maggie Evans wandering mindlessly around the Old House during the kidnapping plot. And in the end Legendre takes a dive of a cliff with a strong resemblance to Widow’s Hill! There’s a nice Bob Hope movie called “Ghost Breakers” that has a slave version of a zombie, some assorted ghosts, a romance, one-liners, and a character called Lawrence Lawrence Lawrence. I think you’ll like it. I have mixed feelings about Jeremiah’s ghost. It’s spooky, but like at least one poster here, it bothers me that he was shot in the face. Either Barnabas was no marksman and “aimed low” but missed, or he had enough hatred in him at that moment to deliberately aim for the face. I like to think it was the first thing. The thing is, when we actually saw him being shot he was hit in the chest. 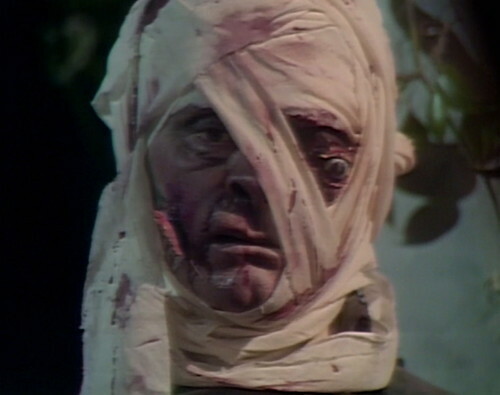 Either his wound migrated, or he had a very incompetent doctor whose bandaged the wrongly part of his anatomy! Yeah – or simply phoenixes. Can you just imagine how spooky and crazy this was in the original airing? Yes, we’ve had a vampire, ghosts and a witch. But this was a new level today, with the dangling eyeball and something that Angelique doesn’t quite seem to have a total handle on. About the “dangling” eyeball, I seem to remember Josette having a similar eyeball in the scenes where she was summoned by Barnabus to re-appear from her own grave. I now wonder if it was just a duplicate make-up job of zombie Jeremiah. 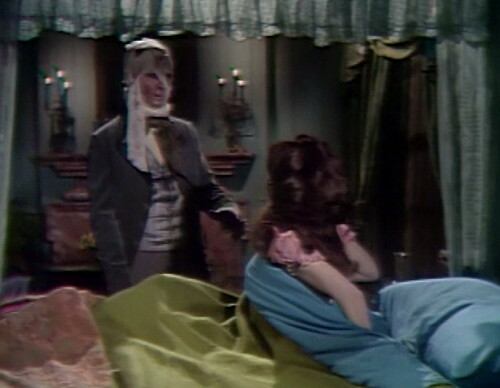 I’m currently attempting to work my way through every episode of Dark Shadows, and am reading your impossibly clever and funny blog along the way. I don’t know if you read comments on old posts, but I thought I’d add my own thoughts on your comments about zombies here, as I think the missing link between those early voodoo-based zombies and the Romero ones is the Hammer film The Plague of the Zombies. 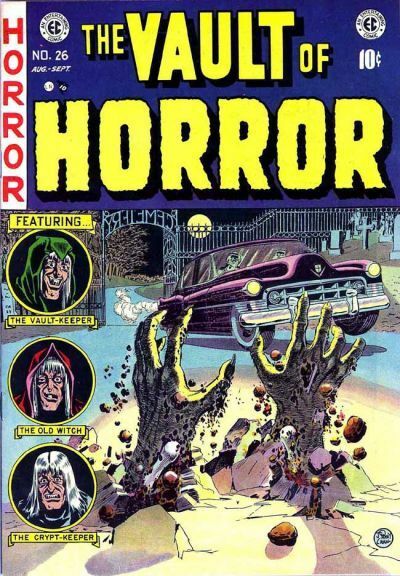 It was released in 1966, and was pretty successful in the US (it went out in a double bill with Dracula – Prince of Darkness), so would probably have been the zombie movie uppermost in people’s minds around the time of this storyline. The zombies in it are in the control of a voodoo priest, but (spoilers) he’s revealed to be a (white) English aristocrat and for (I think) the first time the setting isn’t a Caribbean island. It’s a 19th century Cornish village which, to all intents and purposes, looks a lot like 18th century Collinsport, and the zombies are the revived dead bodies of local people. The most famous part of the film is a very Dark Shadowsesque dream sequence (but with a much bigger budget) where The Dead™ rise from their graves, including hands thrust out of the soil much like we see with Jeremiah here. 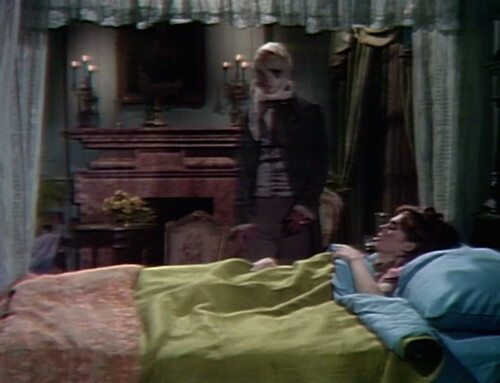 I wouldn’t be at all surprised if that film was on the Dark Shadows’ team’s minds at this time. It’s my favourite Hammer horror, and I highly recommend it if you haven’t seen it. Oh, thanks! I don’t really know the Hammer horror films at all, an embarrassing lapse in my education. That does sound like the major influence on this story. Oh look. Grayson Hall has her 1841PT dress on. They must’ve used it once or twice when they first introduced that PT with a couple of scenes, before they got the fancy wardrobe ready. What is that giant pom-pom like thing that Natalie is holding in front of her in the screenshot above? She was also carrying it when she arrived at the Old House for the first time. I take as much interest in directors as writers. The combo of Lela Swift and Sam Hall on yesterday’s episode is as close to perfection as DS gets, but I thought that in his recap of the hand-from-the-grave today, John Sedwick did not do as good a job as Swift did yesterday. She had better camera angles or something, I’m not sure what they did differently, but today Sedwick truncated the scene and gave it shortshrift, IMO. Never mind about the difference between Swift and Sedwick’s directing. I’ve compared the two versions of the scene. Both of them use multiple angles/cuts of the hand. Not sure why I like Swift’s better. Maybe because hers was first. I think she actually used one edit because there is a slight jump as camera changes angle. Naomi: Joshua, you must treat Angelique tactfully. Joshua: Tactfully? That’s a word I consider unimportant when addressing a servant. Naomi: I’m aware of that. That’s why I mentioned it. This couple is possibly inspired by “The Bickersons,” one of the most subversive old time radio shows ever. Joshua tries to be the authoritative pater familias, but Naomi undercuts him at every turn. He is not as in control as he thinks he is.